This week’s artist, Adam Turman, has a long-running connection to Surly. We’ll let him tell the story. Whereabouts: St. Louis Park, Minnesota. I love it! Can you describe the experience of being the Surly featured artist? Phew. That’s a big question. In my case. I actually was never an official “featured artist” — that program started a few years after I started working with Surly. I’ve worked with them a lot over the last 10 years, and it’s been a great ride. You ready for a story? In 2007, an artist’s collective that I was a part of needed beer for an art show. I cold-called Surly to ask if they’d donate beer in exchange for an illustration design and a run of screen prints. Omar picked up, and he agreed. The art show got its beer, and Omar used his illustration as ad in Beer Advocate magazine. Surly’s audience had just voted them the Top American Brewery, and the ad ran in the magazine as a thank you. We called the illustration Surly Thanks. Because he liked my work on Thanks, Omar asked me to design the first official label for the Surly Darkness 2007 bottle. That’s when things really took off. In 2009 came the poster for SurlyFest, and a screen-printed label for Surly 4, the 4th Anniversary beer. Remember when breweries couldn’t sell beer in their own tap rooms? Seems crazy now. A lot of work went into changing the law to allow that to happen. In 2011, I designed the Power of the Pint, which was the face of the campaign to allow breweries to sell their beer to customers. Happily, the campaign succeeded. This was a big moment in history for Surly, Minnesota, and my studio practice. While I was working on Power of the Pint, Josh “Jawsh” Lemke and I started a mural for the Brooklyn Center brewery. I was new to muraling at this point, so the opportunity to paint a mural for a cool place like Surly was a big deal to me. In 2013, Surly started venturing into tap rooms, and more poster commissions came along. I designed a poster commemorating their Brooklyn Center tap room, and when they moved to their current location in 2014, I designed two posters, Beer Hall Grand Opening, and Surly Destination Brewery. I particularly enjoyed doing the Destination Brewery print. It was a new, more painterly style for me. I wanted to show off the beauty of the building itself. 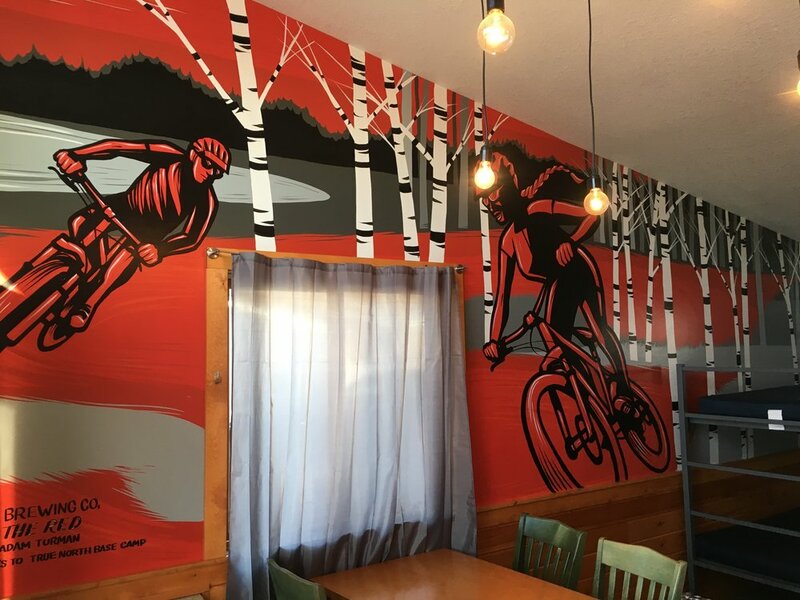 Last month, I finished a mural for Surly’s cabin at True North Base Camp in Cuyuna. I got to spend a fun couple of days at the base camp riding bikes with some of the Surly crew before muraling. It was great inspiration before getting to work. The last ten years have been a whirlwind. What started as a business relationship with Surly has turned into great friendships with their team, and it’s been a privilege to be a part of big moments in Surly’s story. I got to watch it grow into one of the premier breweries in the nation. It’s crazy to think that this all started with cold-calling someone for free beer. Furious, Surly’s flagship beer, is my all-time favorite. It packs a bit of a hop punch, which I love. When I’m going for a Surly, I aim for that one. When it came out, it was one of the most flavorful beers that this region has produced. My second favorite is Hell — when I want an easy-drinking beer, it’s my go-to. I have particularly great memories with two other beers. When Josh Lemke and I were working on the mural for Surly’s Brooklyn Center brewery, the brewers were in the process of making a couple of really cool beers that we got to try. The first one was Surly’s 5th anniversary beer, called “Pentagram”. The second was “Wet”, their wet hop beer. This one is seasonal, and they don’t make it often. For a wet hop beer, hops are picked just hours before the brewing, and then the beer is brewed really rapidly from the fresh hops. We got to watch the whole process, from hops to beer, and got to taste the results! What are you working on now/what projects have you worked on since? Lots of murals. Notably, a mural at the new Radisson Red hotel in downtown Minneapolis — it’s my latest mural to date. It depicts the flock of crows that flies over I-94. Kind of a…little-known Minnesota icon, if that’s possible. You have to be a local to have seen it. In the world of commercial illustration, I’m continuing to work with both local and national clients. Currently, I’m partnering with the City of Saint Paul and SPAM on a couple of fun projects. I’ve also got an exhibition up at the Minnesota Marine Art Museum: Minnesota Illustrated: The Prints of Adam Turman. The museum has an incredible collection, and I’m thrilled to have my work in the company of legendary artists. If people want to look at your other work and/or buy some damn cool art, where should they go to find it? Adamturman.com, as always! Head to our shop prints page to check out the art, and the Shop Merch page to see some cool products made by our partners–we’ve got puzzles, playing cards, t-shirts, pint glasses, and more.